Beijing Ducks outgunned Shanghai to sweep the series. Beijing Ducks outrebounded Sharks 47-30 including a 31-18 advantage in defensive rebounds. They shot the lights out from three nailing 18 long-distance shots on high 52.9 percentage. Beijing Ducks players were unselfish on offense dishing 26 assists. Croatian-American center Justin Hamilton (213-90, college: LSU) notched a double-double by scoring 29 points and 16 rebounds to lead the effort and American guard Aaron Jackson (190-86, college: Duquesne) supported him with 20 points, 8 assists and 4 steals. Even 33 points (!!!) and 7 rebounds by Argentinian-Spanish power forward Luis Scola (206-80) did not help to save the game for Sharks. Point guard Hanchen Luo (188-94) added 19 points for the guests. Both teams had five players each who scored in double figures. Both coaches tested many bench players which allowed the starters a little rest for the next games. Guangsha nipped Zhejiang to even the series at 1-1. Zhejiang Guangsha Lions outrebounded Golden Bulls 54-41 including 17 on the offensive glass. They looked well-organized offensively handing out 26 assists. 24 personal fouls committed by Golden Bulls helped opponents get some easy free throw opportunities. American point guard Courtney Fortson (180-88, college: Arkansas) had a double-double by scoring 33 points (!!! ), 9 rebounds and 15 assists to lead the charge for the winners and international center Jinqiu Hu (208-97) chipped in 34 points (!!!) and 16 rebounds during the contest. American guard Brandon Paul (193-91, college: Illinois, agency: Pensack Sports) responded with a double-double by scoring 41 points (!!! 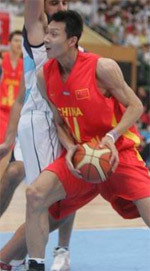 ), 15 rebounds, 8 assists and 4 steals and forward Xuhang Zhu (207-93) scored 23 points and 8 rebounds. Five Golden Bulls players scored in double figures. Both coaches used bench players in such tough game. Jiangsu rallied past Shandong to advance into the next round. Jiangsu Dragons players were unselfish on offense dishing 25 assists. Golden Stars were plagued by 33 personal fouls down the stretch. Serbian center Miroslav Raduljica (213-88) notched a double-double by scoring 30 points, 13 rebounds and 5 assists to lead the effort and forward Yifan Hou (196-92) supported him with 22 points, 7 rebounds and 4 assists. Four Jiangsu Dragons players scored in double figures. Even a double-double of 24 points, 20 rebounds and 6 assists by Lithuanian power forward Donatas Motiejunas (213-90) did not help to save the game for Golden Stars. American point guard Ty Lawson (180-87, college: N.Carolina) added 30 points for the hosts. Golden Stars' coach rotated ten players in this game, but that didn't help. Fujian rolled past Jilin to complete the sweep. 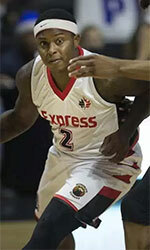 American-Ukrainian point guard Eugene Jeter (180-83, college: Portland) notched 36 points (!!! ), 6 rebounds and 9 assists to lead the effort and international Zhelin Wang (214-94) supported him with 23 points and 17 rebounds. Sturgeons' coach ShiLong Zhu allowed to play the deep bench players saving starting five for next games. Even 30 points, 9 rebounds and 9 assists by American guard Dominique Jones (193-88, college: S.Florida) did not help to save the game for Jilin Tigers. Polish-Swedish power forward Maciej Lampe (211-85) added 28 points and 6 rebounds for the guests.